We started off our drive bright and early leaving West Palm Beach at 5:30am. We made it a point to only stop for potty breaks and dinner at our end location to save time, and get there faster! We drove for about 13 hours that day. I have the worlds most amazing mother. She filled up an entire cooler of drinks, snacks, and sandwiches to get us through our drive until dinner. Isn’t she the best? Getting out of Florida seemed torturous, but when we finally did, we hit Alabama, Mississippi, and Louisiana very quickly. Driving through Florida was our most boring stretch of the drive, and seeing the Louisiana bay was definitely the highlight of our day! The water was so blue, and the air was crisp and cold! We also crossed the Mississippi river which was pretty neat. The drive out of Tucson and into California was like nothing we’ve seen before. As we were exiting the Grand Canyon State, we saw the 15-foot tall, black fence a.k.a the USA/Mexico border. We got stopped by border patrol 3 times, and it is no joke! As soon as we got into California, it felt like we were driving through the desert. There were so many sand dunes–huge gigantic and completely natural sand dunes. It was pretty remarkable. We then started climbing up in altitude, and our ears began popping like crazy. We began weaving in and out of the San Bernadino mountains, and we crossed Devil’s Canyon. California really is the most amazing state. In the short 2-hour and 45-minute ride from the border, we passed through the desert, mountainous terrain with slippery boulders, bright green open area with a multitude of trees, and the most beautiful coast. 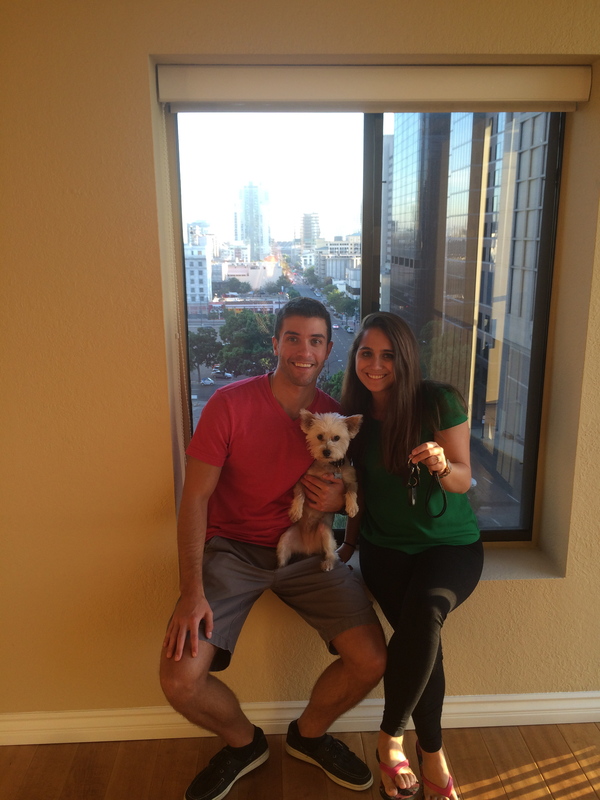 We made it to our beautiful home in downtown San Diego around 5:30pm to pick up our keys! What an amazing once in a lifetime journey. Would we do it again? Probably not, but we are sooo happy we did it while we could. 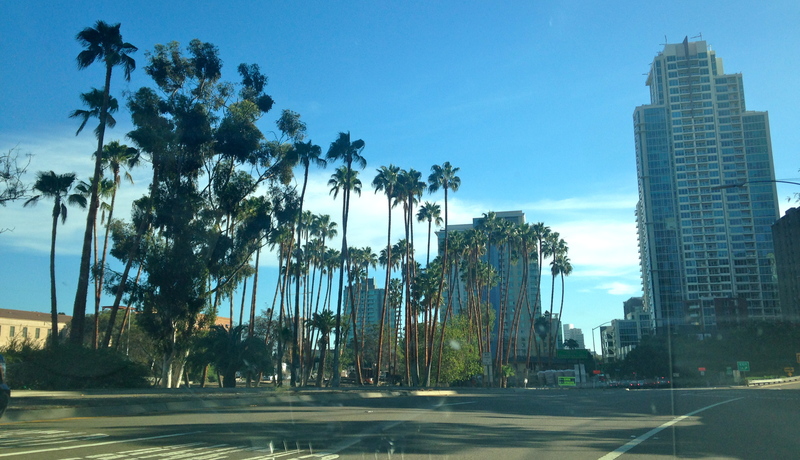 This was our first view driving into SAN DIEGO! Looking back now, this is actually a block from our condo! We can walk here in 2 seconds! 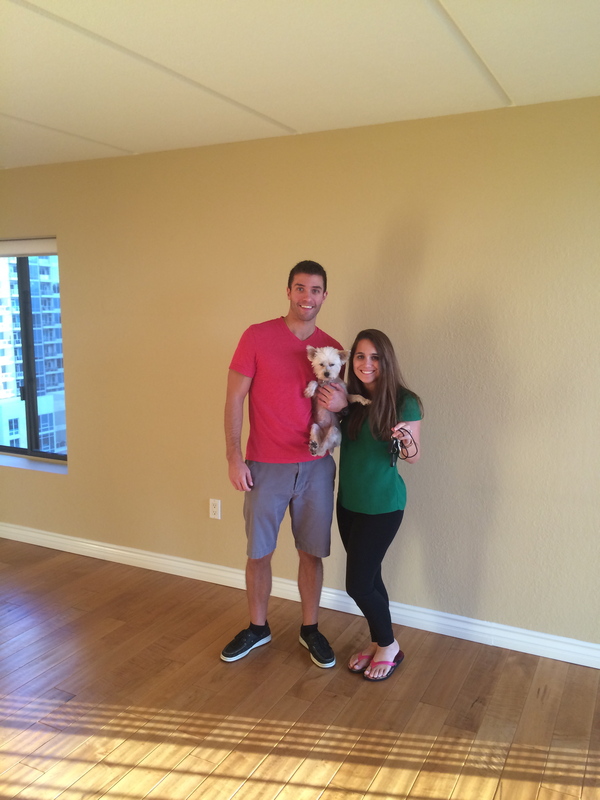 …and this little fam bam couldn’t be happier! 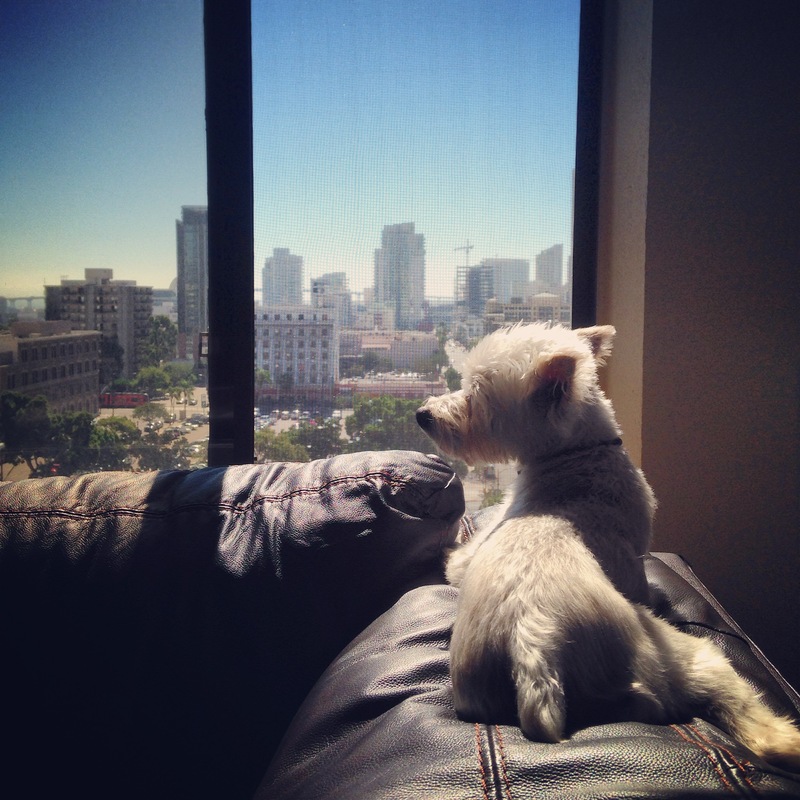 TUCK APPROVES OF THE VIEW! Thank you for following our journey! It was an adventure that will never be forgotten. Cheers to all of my followers, our supportive family and friends, Sean, Tucker, and San Diego! Great pictures!!! I’ve dreamed of doing a cross country road trip. This inspires me even more!! New Orleans is top of my list! I can’t wait to hear more! I’d love to hear about the food. The south is supposed to have great food. Great adventure Christina! It looks fabulous. I love your view. Tucker is adorable sitting looking out the window. Can’t wait to visit you next August! Miss you! Hi Jeanne! Thank you so much! I can’t wait to have you over before Catalyst. I miss you more!!! !